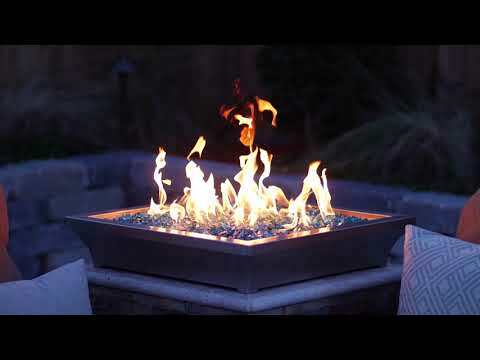 Lakeview Outdoor Designs Lavelle Fire Bowls add a traditional touch to your outdoor living space or landscaping with the added benefit of warmth. This fire bowl is constructed of commercial 304 grade stainless steel with a brushed stainless finish, and features a match lit 304 grade ring burner for years of trouble free use. Add fire glass or lava rocks to match your decor and complete the look. This fire bowl can be installed on a column or pedestal, making it the perfect addition to a garden or poolside setting. Base measures 14 X 14. Lakeview fire pits give your outdoor space a modem touch of style. Available in a variety of shapes and sizes, you are sure to find one to fit your need. Quality made fire pits are constructed with 18-gauge 304 stainless steel. The burner is made with 19-gauge 304 stainless steel. They are available in a variety of shapes, sizes and styles including the Westfalen collection offer straight sides, while the Lavelle collection has sleek curved sides. Both are available in high and low-rise profiles. The smaller size makes this fire pit perfect for installing on a column or pedestal and near pools. Choose from three attractive finishes to fit with any decor: Stainless Steel, Oil Rubbed Bronze, and Black. Alpine Flame fire pit burners and pans are covered by a 10-year warranty. Installation should be done by a qualified professional. Don’t forget to add fire glass or lava rock.